United Nations published the world happiness report in 2017. Four happiest places in the world are 1) Norway 2) Denmark 3) Iceland 4) Finland. Sweden is in top ten list also. The Nordic countries is the happiest area in the world – can we also be the smartest? Smart city concept has many definitions but in general, it is about developing urban areas using new technologies and data as the means to solve the city’s economic, social and environmental challenges. Smart city solutions are usually developed for big cities but the same solutions can be used also in rural areas to save limited resources and enhance the quality of life. Sometimes you just have to think other way round since the problems in rural areas can be quite opposite than the big city problems. While big cities monitor the garbage can to see how often they need to empty it, we monitor to see how rare we need to do it. While big cities monitor the air quality because of pollution, we in the rural areas can monitor the air quality to be proud that it is clean and use that for marketing our area. In arctic rural areas the distances are long and population is scattered and few, but together we can be Smart Arctic Area and embrace the special needs of rural areas in north. Smart city is all about the citizens, who should have all the information they need to make informed choices about their lifestyle, work and travel options. Making their life smarter will probably make it happier also. When resources are small, it is important to remember: do not work harder, work smarter. In rural areas, saving the resources and removal of duplicate resources is very important because urbanization is accelerating and it is forecasted that in 2050 two-third of people will live in cities according to UN Habitat (United Nations Human Settlements Program). Smart applications could be used to optimize road and city lights. In small cities, it is quite common to be the only one walking your dog on the streets at night. Here in the rural areas especially during the nights and evenings only very few people are driving the roads. Is it necessary to keep on the streetlights if no one is outside? Wouldn’t it be more efficient to use sensor and smart technology to solve this problem by turning the lights on and off when needed? Similar technology could be used to monitor road conditions and local tractor could be called to clean the snow off the road. This could even support the sharing economy by using the local tractors and letting the locals to earn additional income. The big contractors typically are not flexible enough to clean the roads in all the rural areas efficiently. When the living conditions are well taken care in rural areas it is also good for the tourism and other businesses further from cities. Public transportation in rural areas typically means there are busses driving without passengers and when there would be a passenger, there is no bus available. Usually these passengers have to use taxi instead of public transportation, which diminishes the use of public transportation. Mail carrier delivering posts and school busses could take also passengers. This could be organized with a smart application where the passenger could see where the drive is coming and if there are free seats. Even the payment can be organized with a smart hands-free ticketing system for passengers like Jiffi App. Engaging citizens to decision making is a growing trend worldwide. City of Helsinki is developing an app to increase citizen engagement in city area. For example, people can take a photo of a defect in infrastructure such as bump at the street and send the geotagged image of it to city personnel with the app. Similar solutions are used in many cities around the world. An innovative company CitizenLab from Belgium is developing a ready-to-use civic engagement platform to reach more citizens, manage participation projects, and drive better decisions. Yrjö Koskennniemi met the makers of this app in Barcelona Smart City Conference last year and they were truly committed in helping citizens have their voice heard, and making governments better understand their citizens. They spoke about how it is important to inspire citizens to participate in the city development and decision making process. In rural areas, the distances are long for the ambulance to get to the patient in time but there is a similar challenge also in big cities since the traffic can slow ambulance critically. Taking care of people does not need to be just responsibility of government or municipality or neighbor – also companies can play their part in social responsibility. Companies have a lot of information of their customers and with that data, they could help authorities in some situations with smart digital solutions. In arctic areas, for example information sharing about extreme weather conditions or wild animals could be life saving. Picture 1. 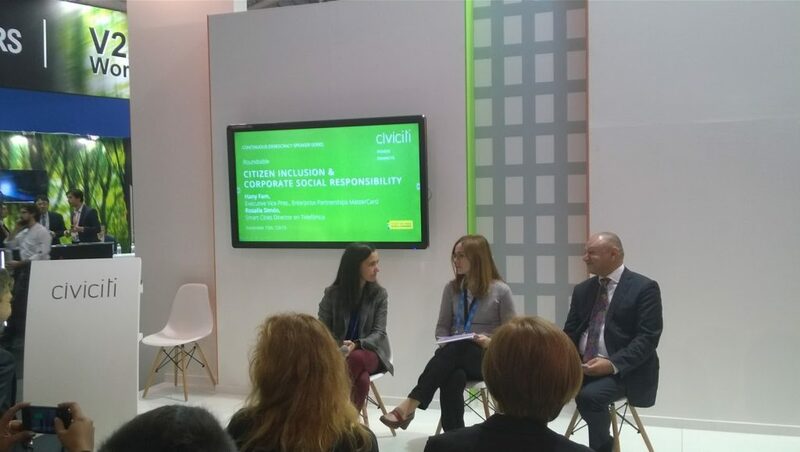 On the left Rosalia Simon, Smart city director at Telefonica and on the right Hany Fam, executive vice president at Mastercard interviewed about corporate social responsibility at Smart City Expo in Barcelona. Citizen help is made easy for example by volunteer app Evapp that they are using in Belgium. These kind of apps could be very useful also in arctic areas. In emergency cases, getting help can take time but there might be someone nearby who could help if he/she knew the help is needed. Emergency center sees if there is a volunteer available nearby the place where the help is needed. The volunteer gets an alert and can get to the place and give the first aid before the ambulance arrives. Collecting garbage from the rural areas is also one resource consuming operation. In big cities, the garbage cans are filled up very fast and they need to monitor them and collect the garbage in time. In rural areas, the situation is other way round and the garbage cars collect often half empty garbage cans. Sometimes there are even multiple companies collecting the garbage in the same village on different days. It would be reasonable to monitor the garbage level with an optic sensor, which knows when the garbage bin needs to be emptied. A Finnish company Enevo is ranked as the world’s best Rising Star of the Year clean-tech company in USA. Enevo is the leading provider of smart sensors and logistics optimization solutions for the waste management and recycling industry. So far, these solutions are most used in big cities because the amount of waste is bigger there but the same solutions could help optimizing resources in rural areas also. Is it possible to make rural areas smart? Most of the money is in big cities since there are the most people. However in every Nordic countries, there are projects about smart city solutions – could we change this thinking into smart rural areas and join our forces? If the Nordics want to be the happiest place in the world also in the future, organized co-operation between people in the rural areas would enhance smartness and happiness. Smart technologies offer a wide range of solutions also for rural areas and they exist already. Most of them are developed for big cities but they could easily be modified and transferred for rural areas. Making the rural areas smart is possible if we do not settle to the cheapest solution but the smartest. Investment to smartness is also a way to happiness. To keep the Nordics the happiest area in the world we should pursue to make them also the smartest. Hopefully someone will launch a concept of smart peacefulness and smart silence – is this the secret to Nordic happiness?